Point-to-point video comes standard with our advanced user subscription. With this service comes the ability to open up video communication between extensions on the network. 55% of communication’s impact comes from facial expressions and body language. Flexible working improves employee productivity by as much as 39%. People learn 38% more and are 43% more persuasive in face-to-face meetings. Recent global survey found that video conferencing increased decision making by 87%. 94% of video conferencing users agree it helps them improve efficiency and productivity. People who telecommute work an average of 7 hrs. a week more than a usual commuter. The YipTel Desktop Client delivers integrated video calling from your computer. This allows your staff to efficiently communicate. This is available as part of our Advanced User feature set. 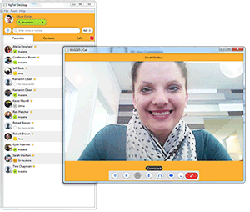 Note that your computer will need to have a toggled webcam in order to perform video calling. Additionally with our advanced user subscription comes our powerful, mobile video platform with video calling integrated directly into your existing smartphone or tablet device. Our platform will utilizing your localized video camera at the top of your phone. You have the option whenever calling to toggle this on or off. Now that we have video capabilities on the desktop and mobile devices it only makes sense to leverage those to deliver Video Voice messages. Our video solution enables advanced users to leave video voicemails on coworker’s mailbox. You can retrieve these from your YipTel Client, Web Portal, and mobile application for a true unified communications experience.